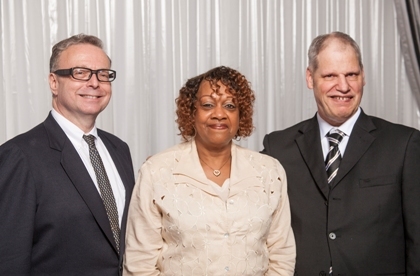 2014 Employee of the Year Award Winners (from left) Jeffrey Siegel, Gloria Harris and Weston Rosiek. The awards were presented at the JVS Strictly Business Networking and Awards Luncheon June 12, 2014. Over 800 community and business leaders attended the event, which featured Honorary Chair and Keynote Speaker Mark Fields, chief operating officer, Ford Motor Company, who extended his personal congratulations to the three award winners. After the loss of her fiancé, Harris dealt with the pain by turning to drugs for solace. Unemployed, facing homelessness and feeling as though her life was spiraling out of control, she was determined to turn her life around and re-enter the workforce. Harris turned to Lakeridge Village, a transitional housing and recovery program. They also referred her to JVS for help with employment. She enrolled in JVS’s Bridging the Gap program, which places individuals in an internship at a local nonprofit where they learn basic job skills and how to become a good employee. Harris was placed in an internship at Lakeridge Village, where she had been receiving help. A highly motivated worker during her internship, Harris was determined to complete any task assigned to her. She primarily worked in housekeeping and provided general office support. “I worked at the desk, I worked in the kitchen, I was a server, I mopped floors and swept floors; whatever I needed to do for my recovery, I did it,” she explains. Once Harris’ internship was completed, Lakeridge was so pleased with her work performance and commitment they hired her full-time as head of housekeeping. “Her knowledge of the clients here and knowing the facility so well, we felt she would be the perfect person for the job,” says Pastor Eddie Williams, CEO of Lakeridge Village. To help Harris transition to her new position, JVS recommended her for a makeover at Illustrious U Salon LLC in Detroit. “It changed my life, as far as my confidence and building my self-esteem even more,” says Harris. Brought up in a family drug store business, Siegel never imagined working anywhere else. When the family was forced to sell the store in 2008 due to the recession, Siegel was unprepared to vie for a position in the modern workforce. He had never looked for a job, needed a resume, created an online networking presence or polished his interviewing skills. Siegel turned to JVS’s Business and Career Services team for help. He completed career assessments and participated in employment workshops to develop job-seeking skills; and his confidence grew. With a clearly defined plan and a newly polished approach, Siegel found a job that was a great fit for his retail and customer service experience. He has been working for more than two years at Batteries Plus in Birmingham as their deputy chief battery problem solver. “JVS is a great place, it has been such a wonderful experience, and I am so grateful,” says Siegel. Rosiek was born with brain damage and suffered from seizures while growing up. He found purpose in life when he joined JVS’s Supported Employment Program (SEP), which helps people with disabilities find meaningful employment. “The biggest challenge Rosiek has is communication and long-term retention of social and job skills,” explains Vicki Anderson, supervisor of JVS community-based services. Rosiek looks forward to each workday, when he travels from JVS to Detroit Arsenal 5 as part of a janitorial crew. He works under the supervision of a JVS job coach as part of the Ability One program, which sets aside jobs for those with disabilities who may not have opportunities to find jobs elsewhere. Working at the Arsenal has also helped Rosiek build relationships and forge friendships outside of his family.